how do i change my tumblr blog layout? i'm having trouble finding where i can change my tumblr blog layout. i see in the tutorial where you can change how you want it to look (looks like a grid layout option etc) , but i cannot find how to do it anywhere. help please....thanks! 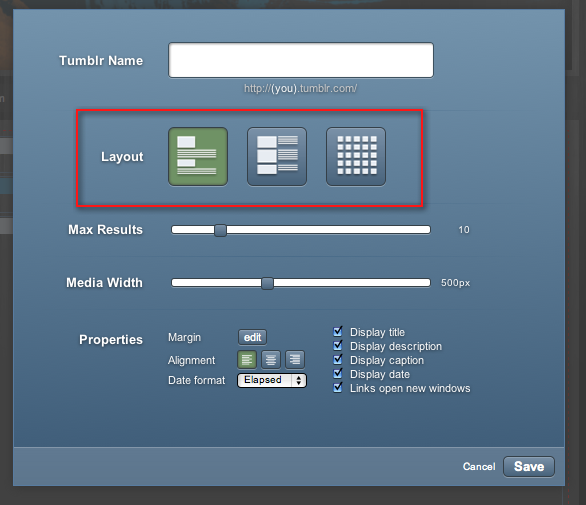 You should be able to locate this when you click on your "Edit" link of your Tumblr Blog Widget. Once you've done this, then you'll see the options to change your layout.